You can send messages from your main Yandex address, your Yandex aliases, or from your email addresses in other services. When you sign up for a Yandex account, you get a mailbox with your country's domain, such as alice.the.girl@yandex.ru, as we as addresses with the ru (Russia), by (Belarus), kz (Kazakhstan), and ua (Ukraine) national domains, and the com domain. These addresses are the aliases of your primary email address. Aliases are necessary in order to ensure that your username belongs exclusively to you. If you sign up for a Yandex account in Russia, another user in Kazakhstan, Belarus, or Ukraine will not be able to clone your mailbox with the same login. Note. 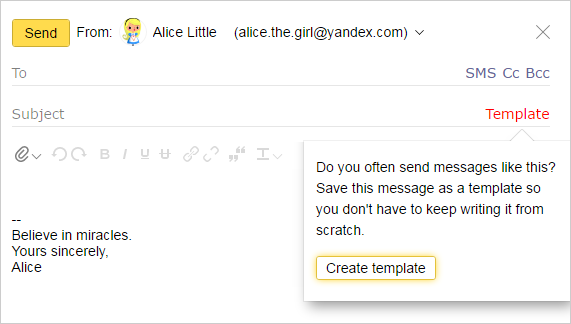 If you created a mailbox with a username that contains dots, for example, alice.the.girl, you will also get an alias with hyphens (alice-the-girl). You can select which address to send messages from under Settings → Personal data, signature, picture. This alias will be used by default for all messages. You can also use your phone number as an alias. If you want to send a message to a recipient from an email address you have on another service (such as Gmail or Mail.ru), then enter that email address on the Email addresses page and confirm that you have access to it. Once you've confirmed it, you can select either your Yandex email alias or your email address on another service in the From field. Attention. If you used another email service to add your additional email addresses, configure the email importer to send your messages from that service to your Yandex mailbox. You won't be able to send messages from that mailbox without setting up the email importer. When you set up your mail importer, enter your complete address (instead of your username). For example, cheshire.katze@forestmail.com. If you can't send emails from your address on another service (for example, Gmail or Mail.ru) even after you have correctly configured the importer, it means that the security rules for that service prohibit sending emails using other services (including Yandex.Mail). If your emails are sent from an address on @yandex.com or @ya.ru instead of @yandex.ru, it means that the wrong mail alias is selected in your settings. To specify an alias for a specific message, click the address on the compose message page and select the alias from the drop-down list in From.